The sun was shining right in our window this morning and we didn't have any great reason to lounge around in bed as the lack of an air conditioner meant the room was nice and muggy after last night's heavy rainfall. The girls gathered up all the shells that they had washed and laid out to dry the night before. We loaded everything up into the car and headed out for our first destination, the ruins of Edzná, just south of Campeche. Depending on traffic and road conditions and how long it took us to explore Edzna, we weren't sure if we could continue on to explore Uxmal as well or have to double back and explore it tomorrow. I personally don't recall ever hearing about Edzná unless it was briefly in my Mayan history class that I took back in 2005 when I returned to school to finish my Bachelor's. I had posted a request for ideas about places to visit during our road trip and another expat had mentioned this place and it looked beautiful. I like to find smaller places that are off the beaten path because it's so easy to miss some places if you aren't aware of them. The drive out to the ruins is a little two lane highway and sometimes you wonder whether you're going in the right direction or not until a random sign pops up on the side of the road and confirms you're not lost. When we pulled into the parking lot for Ednzá, there were only 3 other vehicles in the parking lot. There is thick vegetation and trees all around and you can't even see the ruins from where you stand. The path leads you into a thatch roofed building where we buy our two adult tickets for 48 pesos each and continue walking. The next building has several artifacts that have been removed from the ruins and set up for display. The girls started to run on ahead and then started yelling at us to come quickly because the path was blocked off. When we came around the corner, there were 4 large lizards standing in the middle of that path leading to the ruins. We tried to keep track of all the lizards we saw but we lost count after the first hundred I'd say. The ruins at Edzná were beautiful and peaceful and I felt free to let the girls run all over up and down. We ran into another couple on top of one temple who were from France. She asked me in broken English if I wanted her to take our picture and then we reciprocated the favor. I think my favorite part about traveling is meeting other people. The hardest part about Mexico is the apparent mistrust of everyone so it's hard to really get to know anyone on our travels now. It was only about 12:30pm by the time we had finished wandering around Edzná so I decided that we'd push through to Uxmal before making our way to Mérida. It was about a 2.5 hour drive from Edzná to Uxmal via the "Mérida via Ruinas" route that was well marked. 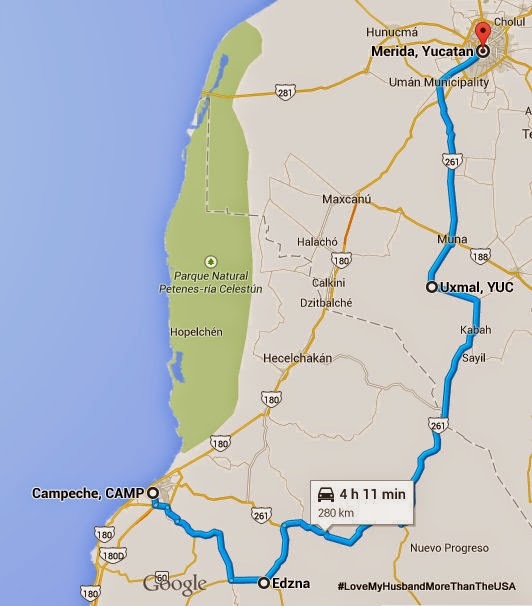 We crossed over from Campeche to the state of Yucatan, our 7th state of the drive now. There was a huge archway over the highway to mark the state line, very classy! Uxmal is definitely a major tourist attraction for Yucatan. There are resorts and restaurants and all sort of businesses set up at the entrance to the park. We had to pay 22 pesos just for parking which has been a first for us on this trip. After parking, I went to the taquilla to purchase our two adult tickets. After handing me two tickets, the cashier told me to step to the next window and purchase two more tickets from the Yucatan tourism board. The state wants their money and the feds want their money too. Only this state chooses to charge extra if you happen to come from another country. The first cashier told me that I'd have to pay the gringo price without even asking if I happened to be a resident. I had a moment of confusion because the feds do not charge for seniors or children under 13 years of age while the state can charge for whatever they want. I gave the two tickets back to the cashier and asked for a refund because I didn't have enough cash for everyone based on the incorrect information he had given me. I stopped to read the flyer that was posted on the wall between the windows and realized that he totally confused me. I'm a permanent resident so the price is only 73 pesos. The cashier was quoting me package prices that were like 183 pesos so I was lost. Anyway, only Jose and I had to pay the two fees and the whole family was finally in. The ruins were definitely beautiful, no doubt about that. We walked up, down, and all around admiring the ancient civilization. It's fun to stand high on top of a temple and imagine where the people lived, worked, and played. It started raining on us while we were walking around the quadrangle of the nuns so we ducked into a doorway to escape as much of the rain as possible. Thankfully it wasn't the drenching rain that can wash you away, just a light one. The wind started to pick up a little by the time we made it to the last of the ruins, the governor's palace. We were sweating from all the climbing up and down so it felt awesome to feel that breeze while standing on top of the world. There is such a sense of awesomeness and amazement at what was created here. I wonder if Jose's ancestors date back to the Mayans or what his lineage is. Mine weren't building anything as cool as this. After Uxmal, it was a short drive north to the capital of Yucatan, Mérida. And the rest is history. José started walking up and down those streets and somewhere in there he just fell in love with the town. It isn't overpriced, it's not immediately on the ocean, the downtown is almost spotless clean(!! ), and it's a safe town. Law enforcement is strictly handled by state police which make their presence known. I guess I should mention that we followed the main highway into downtown. I had plugged the Best Western into our GPS since their website was quoting rates of 595 pesos. On the way there, I noticed a sign for 350 pesos and there we stopped. A five story hotel with AC, wifi, and a swimming pool so we decided to pay for two nights and see this town for ourselves. We treated ourselves to a nice dinner in the center and the whole family to a horse drawn carriage ride around town and it was worth every peso over our budget! Yes, thank you Yvonne, I am finally returning to normal today but it was an ugly journey until now, will update today!